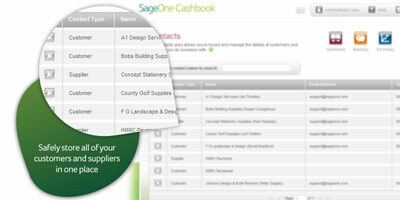 Sage One Cashbook features: More about how Sage One Cashbook can help you to control your cashflow. Do you currently use Microsoft Excel®, or hand over a shoebox or bag full of receipts to your accountant every few months? Does your accountant have to ring you and ask if anything’s missing? If so, then using Sage One can help. With Sage One Cashbook you get a simple way to record all of the money in and out of your business and your accountant can log in to see that information too. This process is all carried out online and the data can be updated and amended in real time. This means your accountant doesn’t need to chase you for your receipts and they can do what you pay them for quickly and easily. 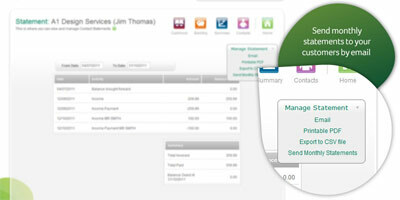 It sounds obvious, but we designed Sage One Cashbook for businesses that do cash-based accounting. 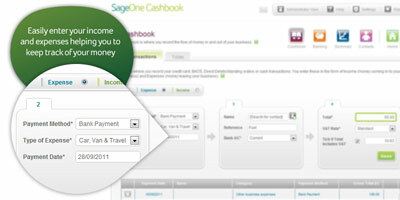 In Sage One you can simply record what cash you’ve paid into your bank, the same way you actually did it. No more having to match specific income or expenses to the actual deposit. It’s really straightforward to do, and lets you record notes against your customers for future reference, which can help you to build a good relationship with that contact. You can also produce a statement of activity against each contact showing all their payments. You can email these direct to your customer and if it’s someone you do regular business with, Sage One online accounting system can send them automatically, saving you time. The simple reports and totals in Sage One Cashbook will let you see where your money is going. This might help you find areas where you can save money or make changes to become more efficient. In the Summary screen, quickly view your income, expenses and get a rough idea of profit for the month and year to date. From the summary screen you can also run a full Profit and Loss Report. 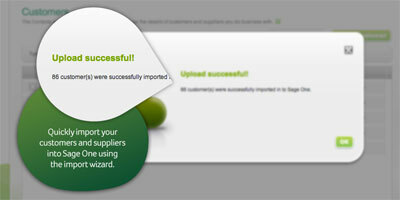 You can quickly add your customers and suppliers to Sage One using the data import wizard. The import wizard will guide you through a simple process and show you how to format and import your data. Record all of your customer details in one place quickly and easily and record notes against your customers for future reference, helping to build a good relationship with that contact. The Profit and Loss report measures the performance of your business over a specified period of time. You can create this report by selecting the dates during which you want the report to run and Sage One will calculate the figures for you. The information can then be printed off or exported as a CSV file. Simply select whether it’s an expense or income and enter the details. Select the payment method, type of expense or income, date and amount. Once you select to save this the information will appear in a list of transactions that can easily be amended or deleted if you’ve made a mistake. If you do regular business with someone, you may want to send them a regular statement of activity. 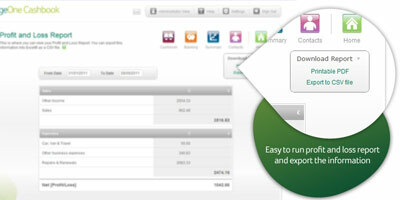 Sage One Cashbook lets you set up recurring statements for your customers. You can email this directly to your contact, print a copy and export the information to a CSV file.